Apple hasn’t offered anything meaningfully new on the smartphone front since 2014’s iPhone 6 when they decided to have a bigger screen. Now on the tenth anniversary of this iconic smartphone range we have the iPhone X (ten), and it’s arguably the boldest iPhone yet. An all-new display joins a refreshed form factor and a boldly innovative biometric security system. 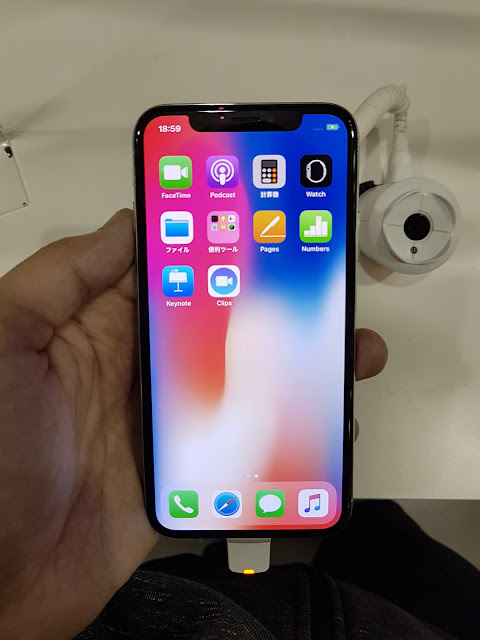 But with prices starting from an eye-watering ₱64,490, the iPhone X needs to do a lot more than merely hint at good things to come. It’s only appropriate that we start with the iPhone X’s display, because it’s the most noteworthy component of Apple’s new phone. After years of envious glancing at Samsung’s vibrant Galaxy S phones, iPhone users finally have an OLED display to call their own. OLED screens differ from LCD in the way that the pixels are individually illuminated rather than uniformly backlit. This means that blacks are much deeper and colour contrast levels much higher. The custom-designed iPhone X display has more accurate colors than any OLED or iPhone LCD display before it, while it’s plenty bright enough in outdoor lighting. At 5.8-inches and 2436 x 1125 pixels, meanwhile, it earns its Super Retina display being the largest and sharpest iPhone screen yet. In practice, the iPhone X screen isn’t as wide as the iPhone 8 Plus display, but it is longer. As a result it doesn’t actually feel as big as the Plus model displays in general usage. Another reason the iPhone X display doesn’t feel all that big is because of the way it’s housed. Apple has finally taken steps to reduce the huge chin and forehead of the iPhone range, as well as the chunky side bezels. The iPhone X display isn’t quite edge to edge, but it does expand out well into the phone’s curved corners. There isn’t even space for a physical home button anymore. It really is quite striking to look at, and it feels like the future - even if the likes of the Samsung Galaxy S8 got there earlier. Apple has had to compromise with this “all screen” design, though. There’s a noticeable notch towards the top that cuts into the natural line of the display. All we can say is that this isn’t remotely distracting in general portrait usage, where the effect of the screen wrapping around the notch into the corners is actually quite pleasant. Where it’s less of a success is in landscape view. When watching videos or playing games, the notch can feel like it gets in the way of content. For videos you can zoom out a little to remove the notch from the equation, but the trade-off is that you’ll have a smaller picture and lose that immersive feeling. Either way, the main benefit of this bezel reduction is that the iPhone X is only a little larger than the iPhone 8, despite having a much bigger display. That’s a major positive given that many still find the Plus models unwieldy. Like the aforementioned iPhone 8 the X has a glass back, which makes it very pleasant to hold. It also enables the iPhone X to support wireless charging, just like the iPhone 8 and iPhone 8 Plus. However, this glass back also means that the iPhone X is far more fragile than previous models. Combined with that huge price tag, the phone’s shiny stainless steel rim, and the fact that the phone as a whole is a fingerprint magnet, this is perhaps the first iPhone where every owner should weigh up buying a case. With the rate at which mobile processor technology improves, you’d be surprised if the iPhone X wasn’t significantly more powerful than previous models. While this is the exact same A11 Bionic CPU as can be found in the iPhone 8 and iPhone 8 Plus, it still represents a sizeable increase in performance over the iPhone 7’s A10. Apple reckons it’s as much as 70 percent faster for low-end tasks. 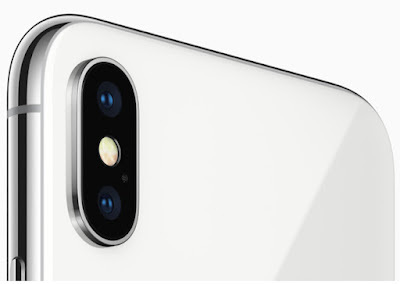 In practical terms this ensures that the iPhone X’s advanced camera features, AR capabilities, and Face ID system all run smoothly. As do apps and games, needless to say - though we noticed a number that hadn’t added support for the screen’s new aspect ratio more than a week on from launch. The iPhone has been one of the best phones for taking picture pictures for years now, and the iPhone X has the best camera setup in the range. Its main f/1.8 wide angle lens camera with OIS is the same excellent example that you’ll find in the iPhone 8 and iPhone 8 Plus. However, its secondary telephoto lens is unique, with a wider f/2.4 aperture and OIS making it better - particularly in low lighting - than the iPhone 8 Plus equivalent. This secondary lens provides a 2X physical zoom system and more pronounced portrait images. Speaking of which, a new feature called Portrait Lighting lets you add studio-style lighting effects to your subjects, both in real time and after the shot has been taken. We’ve mentioned that the iPhone X has a notch that eats into the top of the display, but we haven’t yet mentioned what it’s there for. The TrueDepth camera, as it’s officially called, is there to replace Touch ID now that there’s no home button. This TrueDepth camera is an amalgam of sensors including a 7-megapixel front-facing camera, an infrared camera, a flood illuminator and a dot projector. These combine to map out the contours of your face during the super-speedy iPhone X set-up process. It can be used to create live animated emoji that map to your own expressions, and you’ll see plenty of similar augmented reality applications appearing over the coming months. But the main purpose of the TrueDepth sensor is Face ID. All you need to do to unlock your iPhone X is hold it in front of your face. In practice it’s not quite as quick as Touch ID, and we noticed a slight stutter when swiping to jump into the home screen. But it does feel a lot more natural than Apple’s fingerprint reading system, to the point where you forget it’s actually a distinct process. Until it fails, that is. Fortunately that’s a very rare occurrence, and it should only become rarer with use and as Apple improves its Face ID software. A potentially bigger practical consequence of the loss of the home button is the iPhone X’s new gesture-based interface. We’ve seen it said that this can take days to get used to, but we found it instantly intuitive and a pleasure to use. You can now tap to wake the screen, while swiping up from the bottom of the screen is the new way to return home and exit apps. Swiping up and to the side will cycle through your open apps, while the Control Centre and Notification Centre can be accessed by swiping down from the top right and left respectively. Apple has given the iPhone X a 2716 mAh battery, which is bigger than both the iPhone 8 (1821 mAh) and the iPhone 8 Plus (2691 mAh). It needs to be, given the addition of that larger, sharper display. Apple has focused its storage options to just two with the iPhone X - an ample 64GB or an extremely capacious 256GB. General users should find 64GB more than enough, but if you download a lot of media or shoot a lot of 4K video, the larger size might be useful. 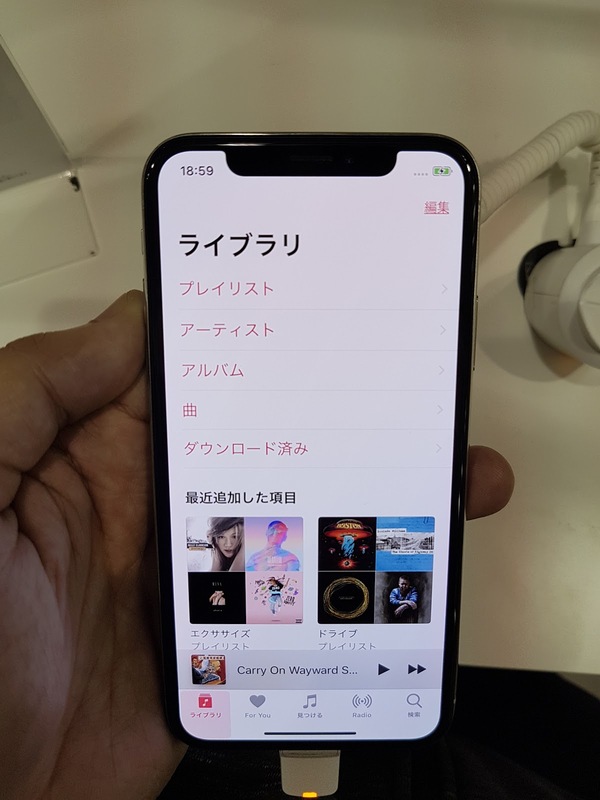 In terms of connectivity the iPhone X is fully equipped for Wi-Fi, 4G and Bluetooth 5.0. It’s worth pointing out that there’s no 3.5mm headphone socket here, so you’ll need to use the bundled Lightning earbuds, your own wireless headphones, or the bundled dongle if you want to listen to music on the go. There were numerous questions surrounding the iPhone X ahead of release, but Apple has answered virtually all of them convincingly. This is the best iPhone ever, and a huge step forward for a range that’s often accused of playing things too safe. Face ID is an almost unqualified success, while Apple’s first OLED display turns out to be the best and most beautiful on the market. If you’ve budgeted for such an expensive phone, you can go right ahead and purchase without hesitation.